The flag stands as a sentinel over a landscape strangely desolate. This is not the neighborhood I remember. 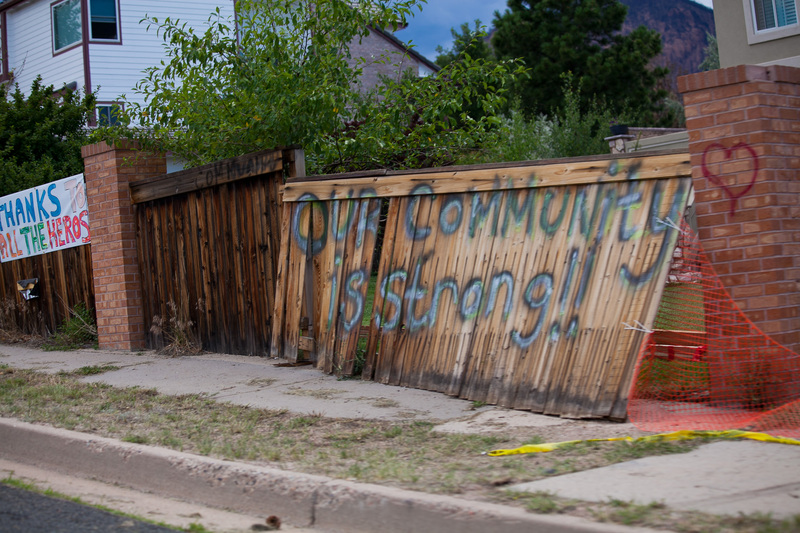 Several years ago, a preverbal lifetime in fact, I lived within feet of the Mountain Shadows community – the neighborhood destroyed in the wake of the Waldo Canyon Fire. Upon a recent trip back to Colorado, I asked my family to take a detour through the community ravaged by the wildfire. Days after containment the smell of acrid smoke lingered in the air and the devastation was gut-wrenching. Disasters are indiscriminate, yet they do not always take everything in their path. Some homes are left untouched, while neighboring properties are razed to the ground. There is no rhyme and no reason to what is left. This is the first lesson of all disasters. 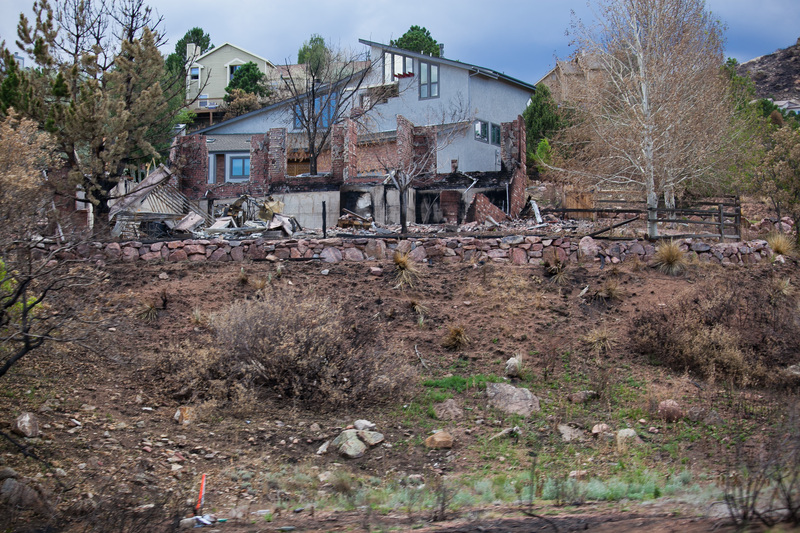 The impact of the Waldo Canyon Fire was no exception to the rule. As we continued our drive, the clouds moved in and I was struck with dread – this community which has already been through far more than most, will experience yet another hazard before the summer is through. Thunderstorms are par for the course throughout the Colorado summer and without vegetation the rainwater has no where to go, but downhill, directly into the impacted neighborhood. Disasters rarely come alone. Wildfires are often followed by risks of flooding. Earthquakes can be following by risks of fire or at the very least a few days without electricity and running water. This is the second lesson of all disasters. Knowing this, the risks and the rewards of their community, neighbors were out in force inspecting, cleaning, clearing and rebuilding their lives. Preparedness is a cultural value. So is resilience. Whether we live here in San Francisco or in another community, we prepare because we want to build our lives there, even after a disaster. We anchor ourselves in a community in the hopes of coming back stronger and smarter than before. That is the essence of resilience. 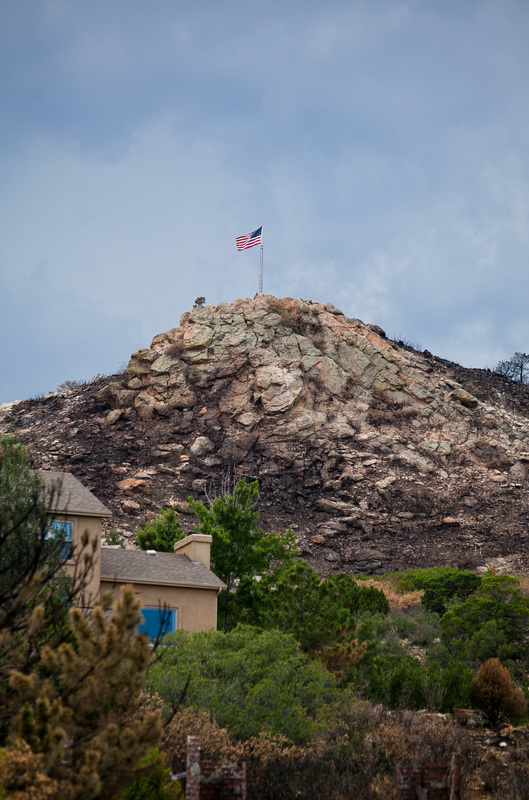 Each of us, like the flag on the mountain, stand as a sentinel, guiding, guarding, protecting and preserving our community because it is our home. I am a native of Colorado. Born and bred on wildfires, flash floods and the occasional winter blizzard. Far different than the pesky hazards that plague the Bay Area. I’ve seen shelves empty from seven weeks of winter storms that delayed trucks hauling loads of groceries. I’ve seen avalanches from heavy, wet snows and landslides from nature-less burn scars. 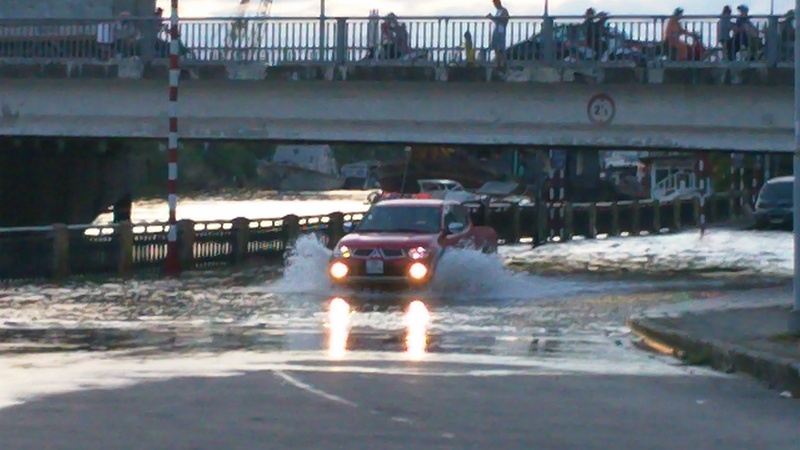 The first natural hazard I remember facing was a flash flood in my neighborhood. I remember once the waters had crested walking outside to see the river flowing, hell-bent, down the street. I also remember my father cursing up a storm because our crawlspace was flooded and muddy. Even now, I remember the neighborhood banding together to protect those among us who might be in danger or need some assistance. So, in a certain way, I grew up understanding resilience and how community plays an innate role in recovery. In the last few weeks, you’ve no doubt heard about the many fires that have raged throughout the Rocky Mountains. My Facebook timeline was scattered with pleas for rain, progress reports on containment and many moving images of the very real damage of wildfire. One particular image caught my eye – something that relates to any community, large or small, impacted by a disaster. You see, the very nature of community, whether it be one suffering from the ravages of a wildfire or an earthquake, is the tie that binds one to the land, the neighborhood, the nature, the very place we call home. It is that link, the one that brings tears to our eyes when we see a place we grew up in struggling against Mother Nature, that breeds resilience and establishes the foundation for a successful recovery. At SFDEM, we often speak about the importance of preparedness and how many, most of us in fact, are more prepared than we think we are. But for a moment, I want to talk about life beyond the first 72 Hours. The most important part of the disaster is after the event. Often times, we think of survival on individual terms, but that certainly is not how one survives. We build our lives as members of a community and we survive as members of a community. And although a community may take a heck of a beating, courtesy of Mother Nature or some such event, it does not burn down. It only grows stronger. 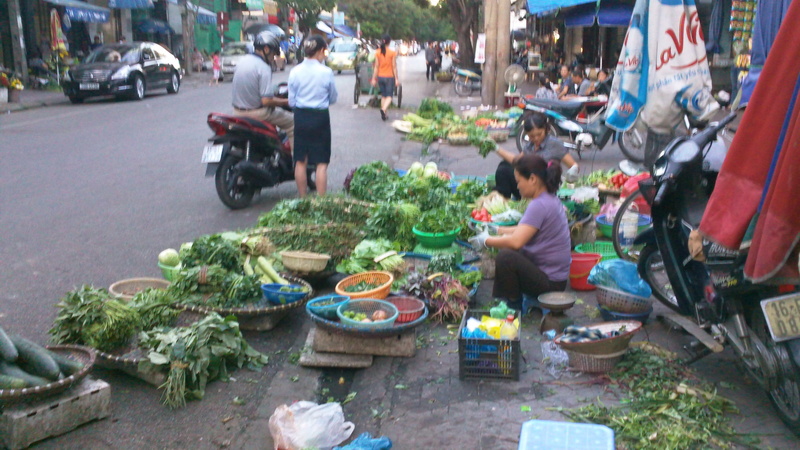 Took at 2 hr drive from Hanoi to Hai Phong – one of Vietnam’s largest water ports located in the Red River Delta. Hai Phong is Seattle’s sister city and our first opportunity to speak with local officials about their disaster preparedness efforts. Not unlike us they face similar challenges with community engagement, funding and having to implement policies that are coming from the national government. 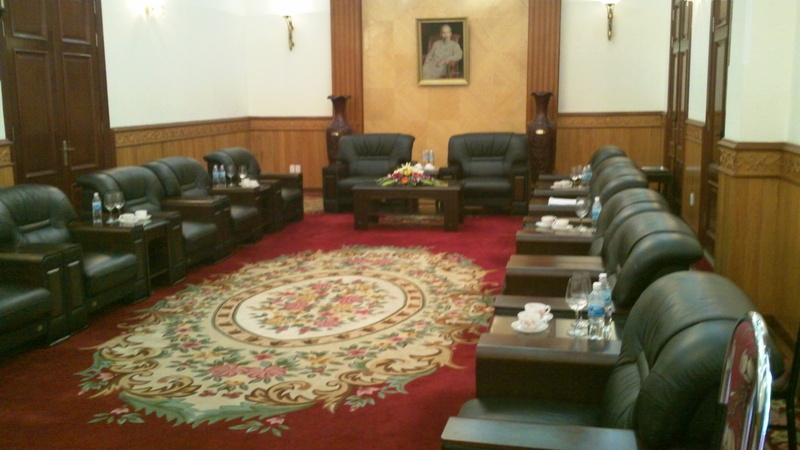 We were met in a formal reception area and introduced to the members of the People’s Party. They discussed how they are applying concepts of the national plan at the local level and encouraged us to as questions; however, when we did they were somewhat evasive in their responses. I sensed that it wasn’t that they didn’t want to share; rather, they couldn’t share. This reflected the central government’s influence in local discussions and what officials could and couldn’t discuss. The next day started with a visit to the Lucerne district, home to 46,000 residents. As a county-level government they were very interested in the SF community engagement materials that we have for our own Vietnamese population. They repeatedly asked questions about the content and said they do not have access to these types of materials. The local woman’s’ group takes a significant role in disaster preparedness. They, along with children, are the primary targets for educational materials. The visit to Hai Phone concluded with an MOU signing ceremony between the Mayor and the Peace Winds America Executive Director, both of whom cited their interest in working collaboratively on future exchanges related to disaster response. 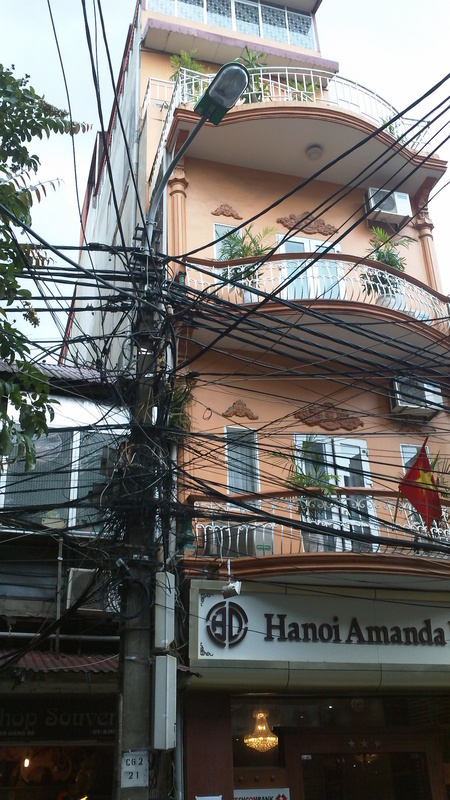 One consistent theme we have heard from everyone – senior officials to business owners is the concern for the impact of climate change on Vietnam. They describe more frequent and more severe storms that lead to increased flooding and destruction. Sometimes you don’t need to go that far out of town to see farm animals just walking in the road. When to use your horn – let someone know you are behind, in-front, or next to them, when exiting/entering a driveway, when you think someone is going to move in front of you, when you see a friend, when you see farm animals, when you just haven’t honked your horn in a while. These are all acceptable. Horns are considered essential (like tires). If yours isn’t working, you don’t drive the car. When you order cat at a restaurant you pay by the Kilogram, not per cat. Bijan Karimi is the Assistant Deputy Director for SF DEM and is currently in Vietnam as part of a sister cities exchange through PeaceWinds America. Their focus is to discuss emergency management principles with their Vietnamese partners and explore ways they can learn from one another during future professional exchanges. When we say community, it carries an implied context of those around you or in your immediate area. However, in the world of emergency management community can take on a much broader meaning. Natural disasters cause billions of dollars of losses and deaths each year. Winter storms in North America are very similar to monsoon storms in the Asia Pacific region. Population migration to urban centers has increased the impact on urban centers and the need for community preparedness. 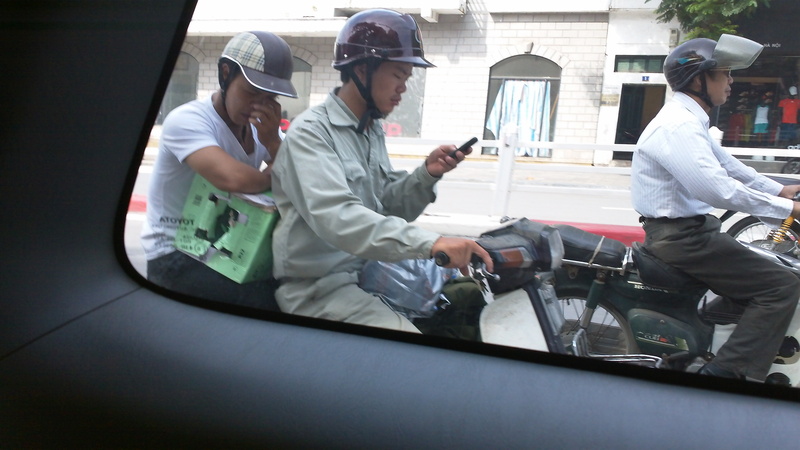 Vietnam is a socialist country, run from a central government. During our first few days of the exchange we met with Ministry officials in Hanoi, committee members, NGO representatives and to discuss the challenges they face encouraging community preparation, government coordination and public private partnerships. As in the US, government, community and private sector are the three pillars that must work together to create a resilient community. Participants in all of our meetings were unanimous in their recognition of the importance of disaster preparedness. The ability to bounce back from an event as essential to encourage economic development and growth. In 2007, the central government recognized the need to put disaster response decisions into the hands of prefecture leaders to speed response. They have also implemented a concept called ‘4-on-the-spot’ which requires management, people, logistics and supplies to coordinate during a disaster. When you visit somewhere new it is only natural to look for similarities and differences to your own experience. These pictures capture a few of the things that came to mind. Now that we have met with ministry heads we can move to Hai Phong (Seattle’s Sister City) and Ho Chi Min City (San Francisco’s Sister City) to talk in greater detail with local ministry representatives and community organizations to understand actual implementation issues and how future exchanges can help increase disaster preparedness. Sometimes it’s better not to know what you are eating until after you have eaten it. A scooter can hold more than 4 people.